A touch of nostalgia with Black and White / grayscale or Sepia tone or a blast of color from the entire palette. In Page Designer using an image element you've uploaded, the object can be washed in two preset colors or any other color from the color palette. 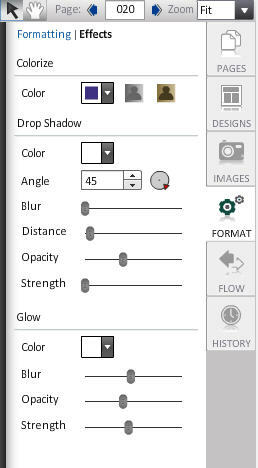 Click the Format button and select the Effects tab. With the image selected, click one of the Colorize icons to change the image to Black and White or Sepia. These are toggle buttons to switch the color on and off. To use a color from the color palette, click the Color dropdown and select any color. TIP: The colorize effects only work on items you've uploaded. It will not work on any clipart that exists in the CLIPART category on School Annual Online.